On a whim, a glimmer of an idea, a question about illustrating a theme began to form. IF I had a visual for “Enchanted Heart Frolics,” what would it look like? I labeled a Pinterest board “hearts” and gathered examples. With a visual forming, I searched Etsy for felted heart-shapes. 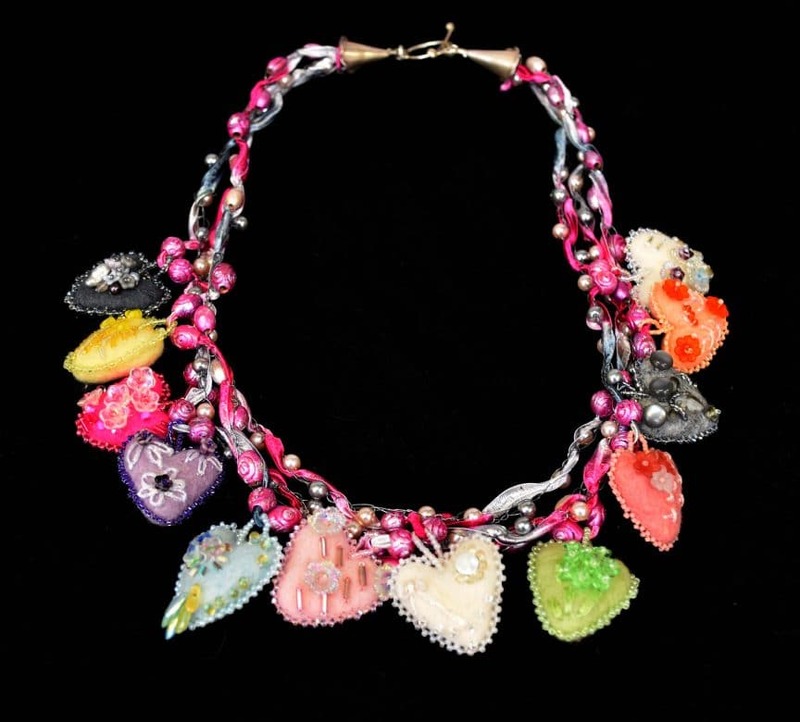 As a beader/jeweler, I assumed my embellished hearts would hang from a necklace. Initially I was without vision for the completed piece, except that each little heart would have beads added to it. Heart-centered ties into my central way of being. Heart-centered and creative. I resolved to add whimsy and lightness to the equation and began my project. All too soon, I was obsessed with little pieces. Each was unique, stitched with a dainty bead picot edging with different seed beads. I added flowers, bugle beads, crystals and even some embroidery. Alas, as I began to assemble the piece, its lack of structure threatened to derail my vision. All of the hearts slid together in an unbecoming clump. Not only would this not wear well, it looked terrible. Undaunted, I decided to add wooden beads around each heart to hold it in place. Instead of the carved plain-colored wooden beads from my stash, I rolled each bead in pearlescent magenta paint that matched the hand-dyed silk ribbon I’d selected for the base. To test my theory, I tried a little section with 28-guage wire, a challenge I’d not yet tackled. Granted, it was an experiment. It went well, although the steel crochet hook made it difficult to finesse the wire. After adding some glass pearls, I threaded the ribbon through my crocheted wire openings. The three-strand result was every bit as whimsical as I’d hoped. Wire added depth and structure. As I pulled the three strands into place, I fiddled with the lengths on a dressmaker so each heart would lay appropriately spaced. Satisfied at last, I tied the ends around a sterling silver headpin, added floral sterling silver cones and a hand-made sterling toggle. I discovered pure delight in the process. The fun of making each heart left me open to its possibilities. I combed my stash for options, using one-of-a-kind findings and keeping each heart mono-toned to complement the felting. For me, hand-stitching is one of the simplest tasks. To my delight, a friend ordered ten hearts to give as gifts, so I continue to make the meaningful singles. Enchanted Heart Frolics lets me express delight, magic and pure joy. It represents for me a “perfect storm” of a fiber arts necklace: wire crochet, sterling silver hand-crafted findings, hand-painted wood beads, felted hearts edged with bead picots, embellished with flowers, crystals and embroidery. See Enchanted Heart Frolics during the March 2019 display (Friday March 1, 2019 – Sunday March 31, 2019) at South Broadway Culture Center, 1025 Broadway Blvd SE, Albuquerque, NM 87102. Enchanted Heart Frolics will also be on display at Fiesta 2019, The 12th Biennial Juried Show & Fiber Arts Exhibition, Thursday May 30, 2019 through Saturday June 1, 2019 at Expo New Mexico, 300 San Pedro Dr NE, Albuquerque, NM 87108.